We are pleased to present Emma Amos’ third exhibition at the Flomenhaft Gallery. The show includes paintings bordered with African fabrics, prints and mixed media works, almost all of which were made in 2009. Amos thought that “Never Forget” might be an apt title for this exhibition as it includes meditations on the artists she has known and the subjects she has chosen to explore. 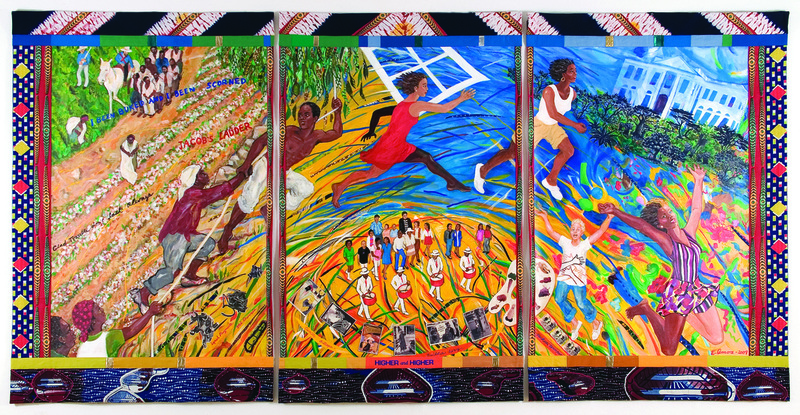 The triptych, Higher and Higher, celebrates 2009 for the leaps our country and its people have made since Reconstruction. The painting was an occasion for Emma to include images by artists whose work she admires -- Mel Edwards, Camille Billops, Jackson Lenochan, Builder Levy - who have used symbols and images that document (or satirize) race and social interaction. After growing up in Atlanta, graduating from Antioch College, and London’s Central School of the Arts, Emma began to work as a painter, printmaker and weaver in New York City. While attaining an NYU Graduate degree, Amos was invited by Hale Woodruff to join The Spiral, a group of artists that included Charles Alston, Norman Lewis and Romare Bearden. The 2 to 3 years of weekly meetings led to long friendships and her determination to continue her working spite of the lack of interest in the art market for the works of either women or black artists. While raising two children with her husband, the late Robert Levine, Amos maintained a Village painting studio, worked as a textile designer and taught weaving. She originated and co-hosted a television series on art and craft for WGBH TV in Boston, in the 1970’s. In 1980, the artist joined the faculty at Rutgers University’s Mason Gross School of the Arts, and retired as Prof. II and Chair of the Visual Arts Department in 2008. “Never Forget” may also be a good way to think about Amos’s Tina (Turner), Toni (Morrison), and Lena (Horne), for the prints are complex. They incorporate shaped handmade paper made at Dieu Donne Papermill in the late 70’s, chine colle collaged on red and black hand-inked, shaped plates and be-sparkled “stages,” printed in 2009. Ms. X is a re-imagining of John Singer Sargent’s Madame X. Two works are included from Amos’ active and engaging Warm Up Series, a group of 7 monoprints featuring dancers with limbs made of deckled edge handmade papers that the artist could pose in many ways before they were collaged onto paper with fabric accents. Fall, My Mother Was the Greatest Dancer, Color and Dream Patterns were painted at Yaddo in October 2009, and completed and bordered at Emma’s studio in November - December. Layered and thoughtful, we hope they receive your close attention. There is something for everyone in these pieces. Identity is from an edition combining lithography and digital printing made at the Brodsky Center For Innovative Prints, Mason Gross School of the Arts, Rutgers University. Twined Flowers, a 4 plate etching with chine colle and hand coloring, was created to benefit Emory University’s Hatch-Billops Collection. This work and Identity were made after Amos became fascinated by a David Siqueiros work with double-faced merging images seen on the wall of artist Elizabeth Catlett Mora in Mexico. Interested that Catlett had known and worked with Siqueros, and that many artists had tried the multi-faced image, Amos made trials on Mora’s press that led to several versions from her own drawings and later, editioned the two images which are now at Flomenhaft Gallery. Emma Amos is a Skowhegan Governor, a newly-retired Professor/Chair at Rutgers’ Mason Gross School of the Arts, a former editor of Heresies Magazine and was featured in the 2009 film premiered at MoMA in October, 09. She lectures and exhibits extensively, and is the subject of writings by bell hooks, Lisa Farrington, Richard Powell, Sharon Patton, and many other authors, articles, monographs and videos.